You are currently browsing the category archive for the ‘Improper Storage’ category. -Food was reportedly delivered by caterer and BBQ dishes sat out at room temperature throughout the afternoon and evening. – Have the proper tools available, such as chafing dishes with a heat source, to keep the food above 135°F. -Pepper and tomato-containing dishes sitting at room temperature may have made the outbreak larger. -Refrigerate tomato dishes below 41°F. – Juices have been linked to outbreaks in the past. – Food handlers should be careful not to contaminate ready-to-eat or drink products. – Wash and dry hands using soap, potable water and paper towels prior to handling foods. – When storing food in coolers or fridges, keep ready-to-consume products covered and above items like raw meat that might drip. 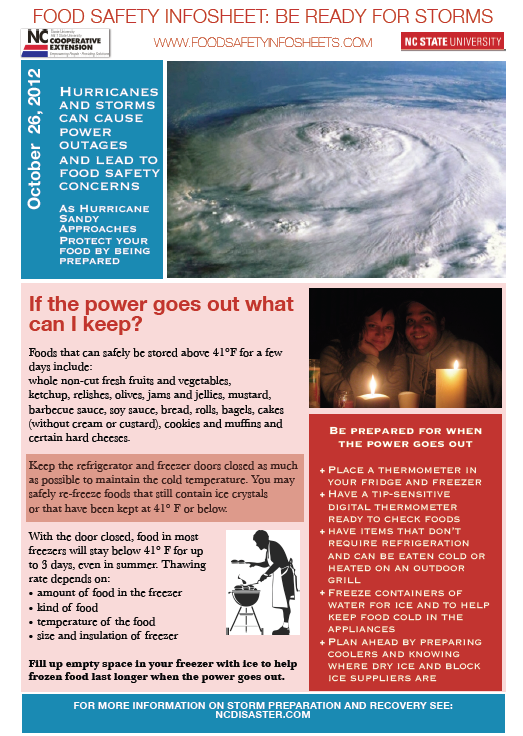 – Hurricanes and storms can cause power outages and lead to food safety concerns. – Protect your food by being prepared. -Inspectors ensure food safety for fair patrons in Wisconsin. 2007 Taste of Chicago outbreak: Despite the focus on vendors by sanitarians, outbreaks linked to festivals still happen. -Dirty water bottles thought to be source of outbreak; five players sidelined from playing, or having any contact with teammates.